Two jolly farces, the first spoken, the second sung, made for enjoyable entertainment by The Victory Players. First, The Virtuous Burglar by Dario Fo encompassed all the vagaries of farce: mistaken identity, extra-marital affairs, thwarted passion, and contrived coincidences, all ending up in a heap on the sofa as the lights (and burglar) went out! My pedantic mind wondered how it could have been resolved in real life if the lights had come on again. The burglar was the first to enter (through the window) and the last to leave with his wife and a stolen picture (through the door). In between there was much enjoyable acting. Colette Randall was an enticing mixture of anticipation, petulance and fear of discovery. Her erstwhile lover, Alan Dearden, was a respectable town councillor who struggles to keep the affair on track while his wife is away. The burglar, confidently played by the producer Greg Field, had been hiding in a huge grandfather clock (where else), harangued by his nagging wife, Jacqueline Kehoe, always on the phone from their own home (conveniently sited at the corner of the stage) telling him what to steal. Inevitably, the other partners and the burglar’s wife turn up and have to be put off the scent. Isabel Gordon, playing the unsuspecting wife whose home this is, gloriously makes matters worse by inviting Colette and Greg (who have been persuaded to pretend they are married) to stay the night. A blustering Rodney Saunders then appears (Colette’s husband) plus a second burglar, Douglas Wragg, who says he is going to complain to his Union about the first burglar’s behaviour. Need I go on? It was all great fun and acted in the true spirit of farce. The Zoo was that rare beast, an operetta with music by Arthur Sullivan but with words not by W.S.Gilbert. It proved to be an enjoyably light-hearted synopsis of everything Sullivan wrote in all his other operas. Again, lovers were at the centre of the plot who, in the true spirit of farce, went through emotional torment before being happily united at the end. It was all good rumpty-tumpty music with some very fine singing both from the soloists and the chorus of bystanders who express their views about the goings-on. The two pairs of lovers, Andy Lunn and Charlie Marshall; and Max Preston Bell and Jane Horrell, excelled themselves. And there was a delicious cameo part at the end for John Humphries as the furious father of Charlie Marshall who forbids the marriage. But of course he later relents. The pianist on the night was Ian White, with Jacqueline Wiginton as rehearsal pianist. The Director was Douglas Wragg. All three must share much of the credit. Praise too, for the marvellous costumes and simple sets in both productions. 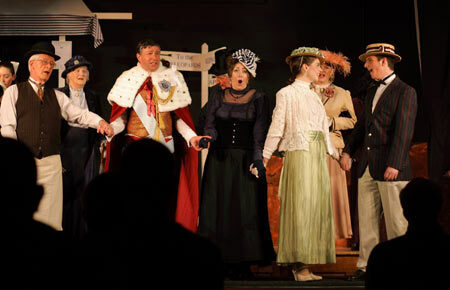 A RARELY performed one act operetta by Sir Arthur Sullivan “raised the roof” at Balcombe’s Victory Hall during four mellifluous performances last week. Never timid of taking on difficult theatrical challenges, Balcombe’s Victory Players again excelled in a double bill of farce by Italian satirist Dario Fo followed by singing in Sullivan’s The Zoo. 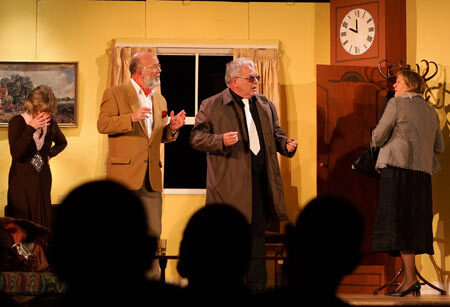 Although the exaggeration of farce is notoriously difficult to perform, the cast of seven in Fo’s The Virtuous Burglar, were bold in their efforts with a script that was challenging in the number of lines to be learnt let alone the execution of humour and irony. The play built slowly as the extra-marital manoeuverings of the main characters, originally set in a divorce-free, very Catholic 1950s Italy, were gradually revealed. But the complexity of a scenario of multiple duplicities developed at a more and more rapid pace to become riotous humour concluded with great panache. Director Greg Field deserves particular credit for directing and stepping in after rehearsals had begun to take over the role of the hen-pecked burglar opposite a very vociferous wife played by Jacqueline Kehoe. After the interval the players produced an entirely fresh cast of five lead singers plus a chorus of 17, accompanied by pianist Ian White and conducted by the play’s director Douglas Wragg. The four main leads excelled in voice and acting, as did John Humphries in the lesser solo of heroine Loetitia’s disgruntled father Mr Grinder. They, and Douglas Wragg’s wonderful stage and musical directing, lifted the performance of the chorus to one of meticulous timing and clarity that at times could have been loud enough to raise the roof of the Victory Hall, literally, let alone be heard outside of the building. The chorus, made up of ages ranging from nine-year-old Jack Holland to several members in their seventh decade, made this a joyous experience of light-hearted operetta for which Sullivan should have received far greater credit than the three previous outings The Zoo received when it was first produced in the 19th century. Their next performances will be in An Italian Straw Hat, a farce by Eugene Labiche, at the Victory Hall, Balcombe, from April 31 to May 3 next year. More photographs are available from the PHOTO GALLERY index. CLICK HERE to download a pdf version of the programme for this production.